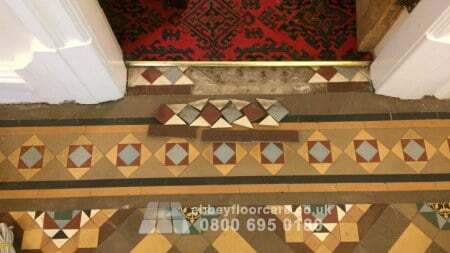 If you live in an older property in the UK you might want to take a minute and have a look under your hallway carpets. 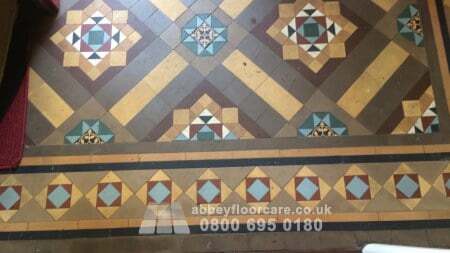 If you are lucky, you will find a beautiful Victorian Minton floor. In most cases, the floor will look work and grubby. 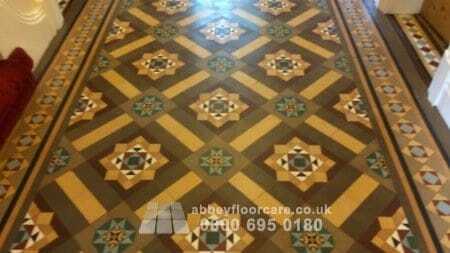 But it is possible to restore a Minton floor to a beautiful finish. 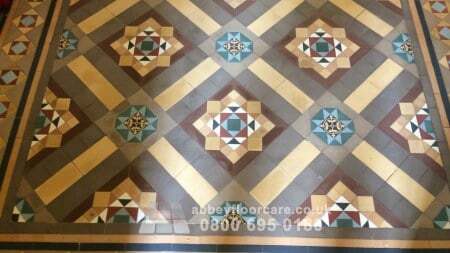 This Minton tile floor was over 100 years old, and over time, ingrained soil muted the colours, leaving the tiles dull and uninviting. 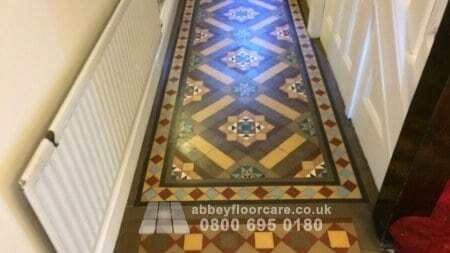 The client had searched for a Minton Tile Cleaning company servicing the Midlands and found our website. 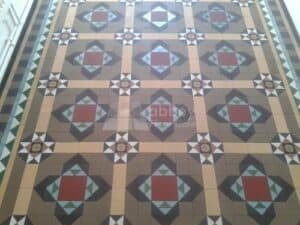 They read a number of our Minton tile posts and saw the how we could restore victorian Minton tiles. 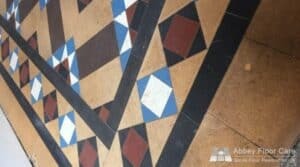 They emailed photos of the floor, and we sent a restoration proposal. 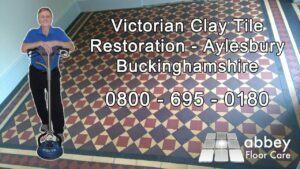 After discussing the options for restoring the Minton tile floor, they hired our services. 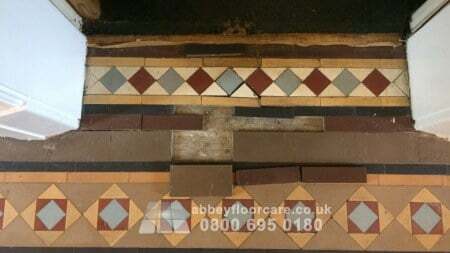 Before cleaning the floor, I had to repair a run of loose tiles. I carefully lifted the tiles, applied an adhesive to the sub-floor and the back of the tiles and replaced the tiles. Once the adhesive dried, I grouted the tiles using a dark grey grout. I applied a Minton tile cleaner to the floor and left the chemical to work for 20 minutes. 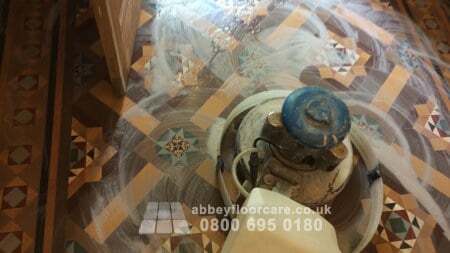 Then I used a rotary scrubbing machine to scrub the cleaner into the surface of the tiles and help emulsify the ingrained soil. I used a powerful vacuum to rinse away the slurry and then rinsed the floor with clean water. Once the floor had dried, I applied 2 layers of colour enhancing impregnating sealer. The impregnating sealer will help protect the floor from water and oil spills. The floor was over 100 years old. Some of the tiles were work and had lost their surface crust, leaving the rough inner portion of the tile exposed. I waxed the whole floor with a beeswax stone floor finish. 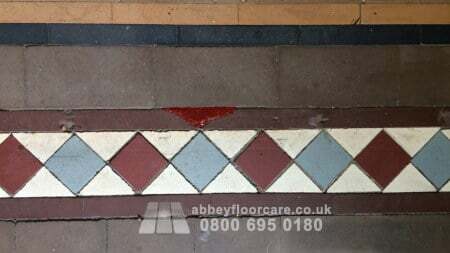 The wax adds protection and makes the rougher tiles easier to dry mop and damp mop. The wax also gives the floor a pleasant low sheen finish. 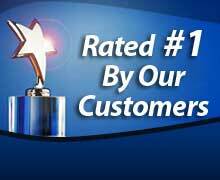 My client was extremely pleased with the results of my work. 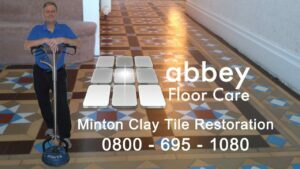 If you have a Minton tile floor that needs cleaning and sealing, please click here for a free, no-obligation quotation.